THE CUTENESS! I LOVE YOU FOR THIS!!! Chibi Cas is so cute! That piece he's eating will probably make him so hyper. Happy way belated birthday Dean! 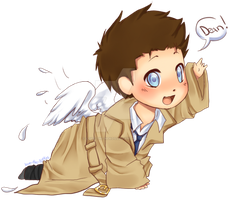 Chibi!Castiel: Dean. I would like some pie. Dean: Strangest birthday ever, but at least there's pie. I thought it was gabe diving in the pie? Mini-Cas and Mini-Sam are cute. Mini-Gabe looks... hungry. and Gabe pfffft, but he really want pie and incur Dean's wrath? Wonderful picture. LOL, of course Gabriel would be the first to dive for the cake.